We had a bit of a foiled camping weekend that ended up with Laurenz and I spending nearly 4 delightful hours at the Swan Emergency Dept. having a “laceration to his head” cleaned and glued! I got to say a big “I TOLD YOU SO” as I had indeed told him not to run into the Jayco until it was fully erected BUT NO apparently he knew better than me and scraped his noggin on an exposed bracket! Poor wee soul! So the Card Making Magazine I had planned to sit by Lake Leschnaultia with, was read at home with a glass of vino instead! Anywho what does all this have to do with my Just Add Ink Project for Colour Challenge #7? 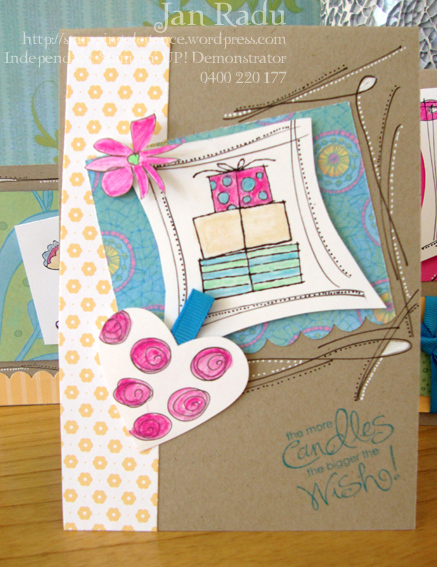 As I devoured my magazine (I don’t splurge on these very often at $9.95 a bundle), I couldn’t get past a gorgeous layout with a group of cards featuring doodling as accents – and I JUST HAD TO TRY IT! So I pulled out all the necessary colours for this weeks colour challenge at one of my favourite Challenge Blogs- Just Add Ink and grabbed my Happy Moments sale-a-bration FREE stampset, and got to colouring with my Stampin’ Pastels and Blender Pens. 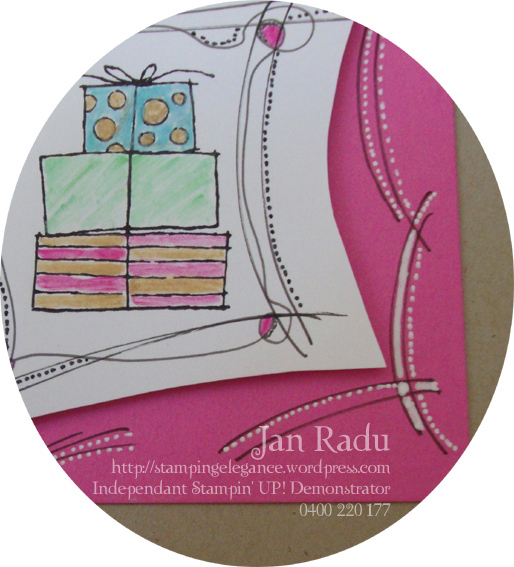 Then I grabbed my Stampin’ Write marker in Basic Black and got to doodling! First I doodled frames around my stamped images, then coloured in bits and pieces and added rows of dots here and there with my basic black stampin’ write marker and white gel pen. 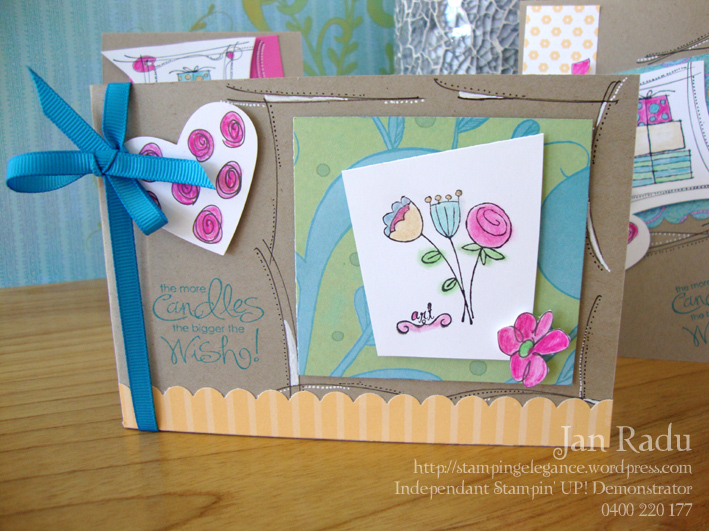 Everything you see on these cards except for stamped present and bouquet from Happy Moments has been doodles, coloured by hand and cut out – including the little flower accents and all borders and frames. Why not have a go at this technique yourself the next time you sit down to create? And while you are at it, stop over at Just Add Ink and have a look at the other gorgeous subsmissions – so much talent – so little time to create!!! You make this look effortless! I get so particular about doodling, so the whole thing loses that artistic feel to it. I love these cards! Great job! 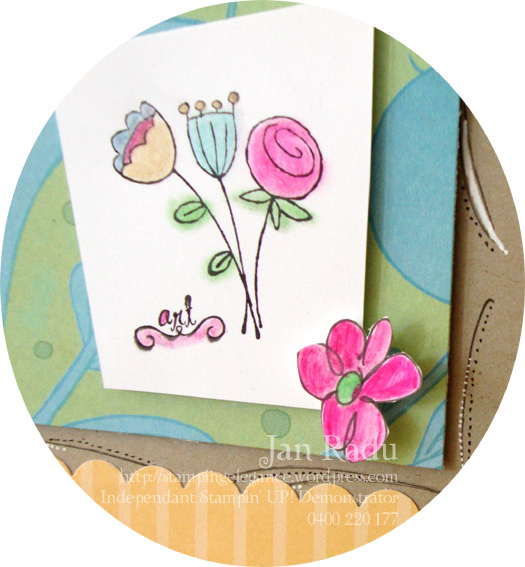 Lovely Doodling Jan..doodling is addictive I might warn you..but so much fun! Who would have thought that doodling could look so good?? 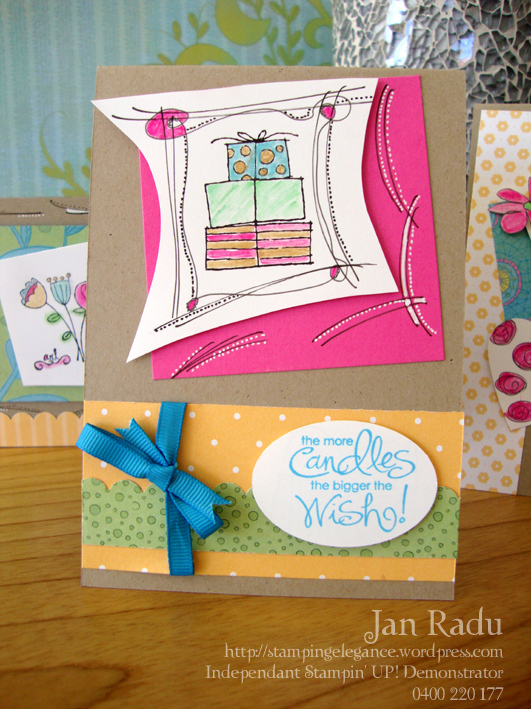 I love the Doodling … but it’s deceptively difficult to make it look as good as you have … great cards.